Sara Mohr-Pietsch is joined by Robert Hollingworth to delve into the world of Monteverdi's madrigals. Including a recording of I Fagiolini performing the second Dixit Dominus. Sara Mohr-Pietsch delves into the world of Claudio Monteverdi. 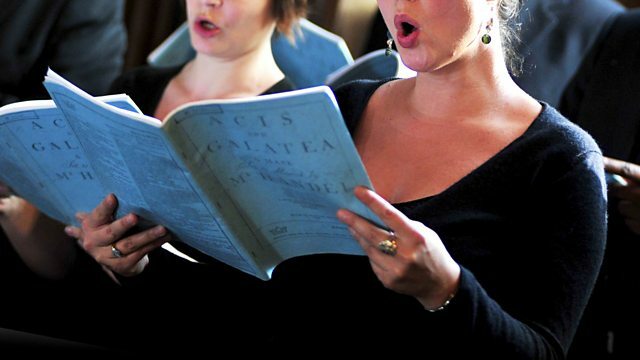 As part of BBC Radio 3's Monteverdi 450 season, The Choir focuses upon the composer's madrigals which make up a large percentage of Monteverdi's output. The madrigals often display Monteverdi's youthful passions and angst whilst he was employed in Mantua, and Robert Hollingworth joins Sara to share his thoughts on how small and larger choirs can perform these works. Also included in the programme is music from I Fagiolini's latest release directed by Robert Hollingworth, performing Monteverdi's second Dixit Dominus with the English Cornett and Sackbut Ensemble. Ensemble: Les Arts Florissants. Director: Paul Agnew. Performer: Rinaldo Alessandrini. Ensemble: Concerto Italiano. Ensemble: The English Cornett and Sackbut Ensemble. Director: Robert Hollingworth. Performer: The 24, University Of York.